What do you want the ninety acres of vacant land in our community, where once stood thousands of units of public housing, to look like? We want to hear from you!! This once-in-a-lifetime opportunity to have meaningful, informed and creative input into what the future of our community will look like is too important to leave up to chance. Please join your neighbors and public officials on Thursday, May 9th at 6:30 p.m.. at the National Italian American Sports Hall of Fame at 1431 W. Taylor Street to review designs by nine very talented graduating fifth year students of architecture who have spent many months working at the University of Notre Dame’s Center for Building Communities on plans for Roosevelt Square. One very talented student has designed a new CPS public high school and has already had his preliminary work critiqued by the Capital Architect and Design Manager for CPS as well as some community residents who are talented architects. We’ll be using this meeting to kick off a very intensive process to collect community input to significantly influence how the rest of Roosevelt Square is planned and designed. We want and need your ideas for how to shape this community input process. 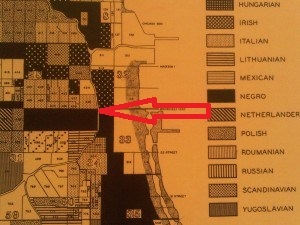 The Roosevelt Road divide in our community still remains. Most of the land where public housing once stood is now vacant. A map from 1940, that is part of a wonderful Art Institute of Chicago exhibit, They Seek a City: Chicago and the Art of Migration, 1910-1950, is a visual, historic reminder of the legacy with which we still live. It’s time to bridge the socioeconomic gulf that Roosevelt Road has always symbolized. Good planning and design, informed by meaningful, skilled community input, can go a very long way toward building a strong bridge. Parking is free behind the Hall of Fame in the lot off of Fillmore Street. Children are welcome to attend.